Writing ad copy can seem pretty difficult. As an advertiser you get 95 characters – 25 Headline characters, 35 Destination Line 1, and 35 Destination Line 2 (35 more if you want to get creative in your display URL) – to blow your competition away. In addition to writing killer ad copy, you also need to make sure you’re generating the highest possible ROI for your client, while remaining (for the most part) in premium position, maintaining a high click through rate (CTR), and keeping your costs per click (CPCs) to a minimum. Although I haven’t been in the Paid Search “game” for all that long, what I have done is written countless lines of new ad copy and conducted numerous tests… and now I’m here to drop some knowledge on you. Writing ad copy doesn’t have to be difficult. I’ve learned a few tricks to follow in order to write some good, quality copy, and I’m going to share those with you. Inserting the main keyword into the headline will first and foremost, increase the relevancy of your ad. 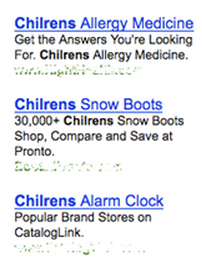 When a keyword is included in your ad, and it matches the search query, you will see the keyword in bold. This is an effective method to getting noticed and provides potential to have your ad stand out from the competition. Using Dynamic Keyword Insertion (DKI) can also be an effective tool, as the keyword which triggered your ad to be shown is dynamically inserted into the headline of the ad. When used correctly, DKI can be a highly effective writing technique, but you need to be careful. It’s important to make sure the ad reads like a human carefully wrote the ad, not something that was put together by a robot. There’s nothing more cringe-worthy than searching for something on Google and being served an ad that is so clearly using DKI that it’s painful to read (misspellings, generic, out of place, etc.) Yes your ad stands out right now, but not in a good way. Be strategic about it. 1. Exclamation Mark – Google will not display it as part of the headline; instead it will extend the D1 with no punctuation. 2. Period – The full sentence is shown. Period. 3. Question Mark – Google will extend your ad’s headline with the question mark, which can be a very good trick for improving click-through-rate with questions. 4. Comma – Google will not extend your ad’s headline. 6. 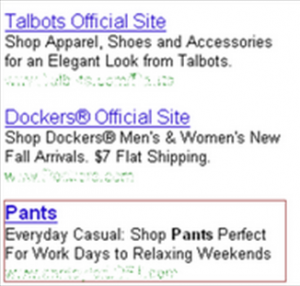 No punctuation used – Google will not extend your ad’s headline. The most important point to showcase in an ad is what specifically sets your product apart from the competition. Do you offer free shipping or returns? Say that. Is your product 50% off right now? Let people know. Are you having the world’s largest inventory sale that may as well put you out of business because it’s THAT good? Well, you can’t say all that because it’s more than 35 characters, but I think the point is clear. Outline the product, sale, offering, or service you offer that the competition doesn’t – or maybe you do it better, just make sure it stays relevant. Really, anything relevant to your product you want the customer to do that’s going to result in a conversion. Give people a reason to click on your ad, and they’re more likely to do so. What’s one of the biggest motivators to the human race? Time (i.e. scarcity.) People don’t like to feel like they’re missing out – In this case, we could call it FOMO in the sense of consumption. In your ads you can use offers that are limited by time or quantity by using phrases such as “Promotion ends in __ Days” or “Only __ In Stock”. By using these phrases you’re encouraging customers to buy now in order to avoid missing out. This may seem like a lot of work, having to update your ads so frequently, but an increase in click-through-rate may be worth it. If you’re counting down days or hours in your ad, Google has you covered; all you need to do is update your ad parameters. To learn how, click here. You may come across ads that are all lowercase and some that include capitalization. Capitalizing every word is more for visualization purposes, but it’s effective. It helps your ad stand out by appearing larger, and personally I think it makes it look more important or official. Just me? Ok. Capitalize away; just don’t capitalize articles (“a” and “the”) because you know, grammar. If you’re able to include a specific price for your product, do it. Customers are generally searching for products and services they want, at a price they want to pay. 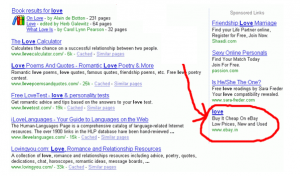 Make researching easy by inserting specific prices in your ad copy. As a customer, I don’t need to click on the ad to find out how much it would cost me to insure my phone because it’s stated directly in the copy. Ad extensions allow you to add extra information about your business or offering to your ad. For example, the ad below utilizes Seller Ratings, Callout, Social, and Sitelinks Ad Extensions. • Location Extension – will display your business’ address, phone number and a map link. • Call Extension – provides your ad with a call button. • Callout Extension – (purple arrow) adds descriptive text to your ad to help people learn about what you have to offer. • Social Extension – (green arrow) shows how many Google+ followers you have. • Seller Ratings Extension – (orange arrow) shows your average customer rating from Google Trusted Stores on a scale of 1 to 5. To learn more and to discover other ad extensions, click here. Aside from the headline, the copy is identical. In this specific test we’re looking to test “mico-moments” by using the term “Near You” in the headline. Remember to only change one variable at a time, otherwise it will be difficult to pinpoint what had a positive effect on your ad. Let the two ads run simultaneously until you have enough data to determine which version is performing better (i.e. which helps you meet your advertising goal.) Once you begin to gain an understanding of what works and what doesn’t work so well, continue to test your ads against your best performing ads. A good rule of thumb is to always keep the same headlines and description lines that have proven to outperform other ads in the past, and to make small adjustments to the rest of the copy. Even small changes can help you discover performance boosts in your ads. Another important factor for testing is to make sure your ad rotation is set to ‘Rotate Indefinitely’. You want to make sure each ad is being served equally as this will provide you with the most accurate results possible. There are many different strategies behind writing ad copy and each advertiser tends to have their own style/preference. Be open and don’t be afraid to get creative! You don’t want your ad to be glanced over because it looks like every other ad being served. And if you ever get stuck, know there are tons of resources and case studies available online. A lot of the hard work has already been done for you; it’s up to you to test and figure out what makes your customers convert!